NEW LISTING in MOUNTAIN'S EDGE!! REAT VIEWS AND PRIVACY AT THE TOP OF MOUNTAIN'S EDGE! Perfectly situated next to the Greenbelt, this 3 bedroom, 2 bathroom townhouse with a private yard is a great family home. The bright open living space on the main level offers new laminate flooring, vinyl flooring in the kitchen and new light fixtures. The Great Room features a cozy gas fireplace and sliding doors to your large deck with Greenbelt views. 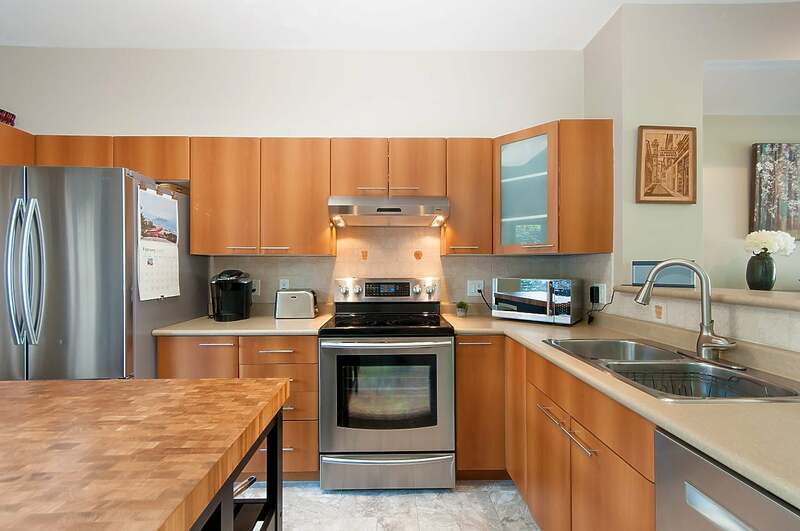 The kitchen features upgraded stainless steel appliances and a new custom entertaining island with extra open storage. From the kitchen walk out to your private, decked back garden. The upper level boasts new carpet in all bedrooms. Enjoy gorgeous sunset views from the master bedroom of the Gulf Islands and twinkling city lights. The master also features a lovely ensuite with a walk-in shower. Access the double tandem garage from the lower level, which offers plenty of storage and newly installed shelving. Great location with easy access to all level of schools; walk to Aspenwood Elementary, Eagle Mountain Middle and Heritage Woods Secondary. Next to nature, trails, beaches and amenities, don't wait to start your new life in this family friendly, well maintained complex.